In the ear where everything is going digitized the healthcare industry is also experiencing e-health with a wide range of activities, scope, and approaches. This is all about exploiting the information and communication technologies in the clinical domain. Considering the mass adoption of the internet and mobile, more and more people are becoming health conscious. They want to find new ways to be in control of what they eat and how they maintain a healthy lifestyle. Earlier, e-health was restricted to computers and digital equipment but now its scope has become extensive and it's on the mission to transform the very nature of the medical industry. Let's try to understand with the help of different definitions provided by esteemed organizations. According to the tech giant Intel, e-health is all about how key players in the clinical domain and advanced technologies are trying to maximize the benefits by integrating healthcare and internet. The primary objective of e-health is to improve the quality of care globally through utilizing information infrastructure. It's not only about technological development but it's also related to psychological well-being. One of the most prestigious medical entity World Health Organization (WHO) describes e-health as a secure and cost-efficient way of using communication technologies in order to enhance relevant fields like health education, research and knowledge, health surveillance, healthcare, etc. e-health can be considered as a comprehensive term which works on the principles of utilizing advanced information and communication technologies to benefit caregivers, healthcare organizations, medical practitioners, patients, and the public. 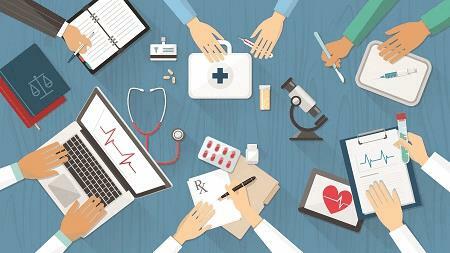 How E-Health Is Reshaping The Medical Sector? It's not good to limit the concept of e-health to a specific set of activities or principles. But it's an all-inclusive initiative to let people access to proper healthcare when they need it. Also, it allows them to track their daily health data and maintain a proper lifestyle simultaneously providing medical practitioners with seamless access to data as and when they require. But in order to understand the impact of e-health on the clinical industry, let's look at its implications in an everyday medical aspect. There are several devices and solutions available in the market that people can use to gather their vital stats checked such as pulse rate, BP, heartbeat, etc. Also, there are a plethora of m-Health apps that allow people to track their health and physical activities. Moreover, some of these solutions can even be worn around your body in order to exhibit all your vital stats. With the help of e-health, a central framework is designed where all these records can be stored and owned by patients. Also, they can share the data with due concern to relevant stakeholders. The medical records that come under the umbrella of e-health comprise a huge amount of data which can be valuable for medical scientists, researchers, and experts. They can easily use this data to come up with insights into developing positive patient outcomes and creating better treatment plans. Nowadays, telemedicine and other communication technologies are being used to share confidential health-related details with remote doctors. This is the best way to make healthcare accessible to all in an affordable manner. E-health has the potential to break geographical barriers and develop a comprehensive health network at global, nations, and even regional levels. This will let people of underdeveloped areas have seamless access to care services. There is no need for manual recording of data in e-health systems which automatically decrease the chances of any human errors. Also, this system has the potential to provide patients with quality care by utilizing specific data and medical evidence. E-health can act as a central repository to host different treatment information, health awareness programs, and prevention tips. Medical organizations can promote digital self-help guides, health portals, and journals so that to make people aware and encourage them to develop healthy habits. This technology can be a lifesaver for managing supply chain activities and simplifying circulation of drugs. Also, it can facilitate better clinical decisions by helping in setting up schedules, hospital administrative tasks, billing systems, etc. E-health can be the best asset to establish accountability and transparency in the clinical procedures. Equipment and machinery used in clinical settings are also an integral part of the e-health concept. By using information and communication technologies in this set up can facilitate improved diagnosis and treatment, efficient medical imaging procedures, better digital diagnosis, competent training sessions, smart surgery planning, etc. E-health is transforming the way in which care is delivered across the globe by empowering doctors, patients, healthcare providers, and other stakeholders with powerful tools to streamline the diagnosis and improve the efficiency in healthcare.